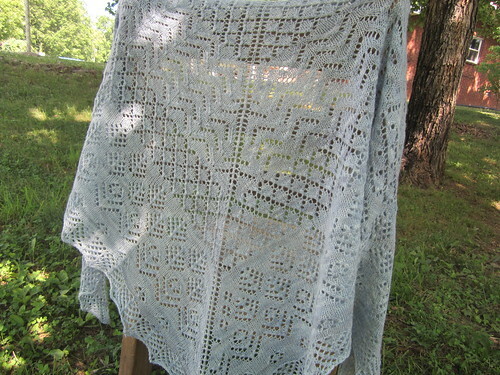 I am very happy to announce that we have two more gorgeous shawls off the needles and joining our booth display this coming weekend at the Friends and Fiberworks Summer Retreat in Asheville, NC. May I present to you the lovely sister shawls Elizabeth and Liz! I showed you the beginnings of these two back in early May. 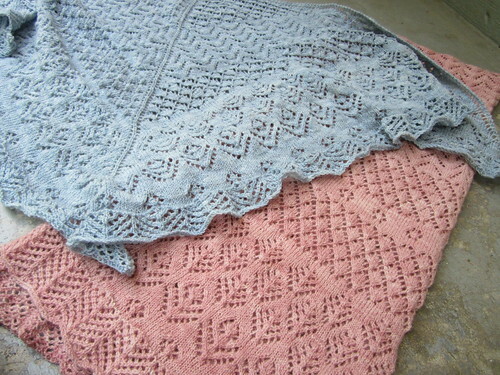 They are both the design creations of Dee O’Keefe and are both knit from three skeins of our Classic Merino Lace yarn. The blue one is Elizabeth and the color we chose to use is Winter Sky. 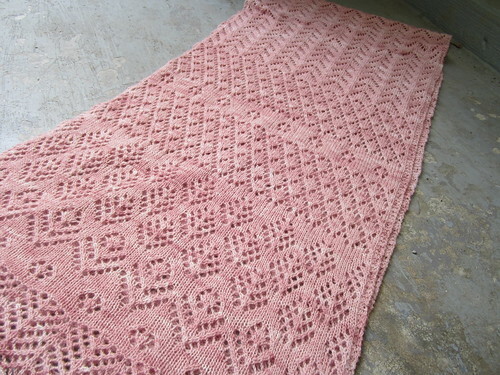 Liz is the stole version and we made it with the Tea Rose. I can’t wait to see them on display along with Edwina. I think they compliment each other so wonderfully and I hope they inspire you to make your own versions. 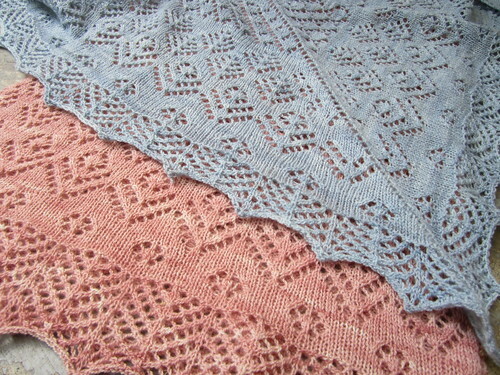 Both these sister designs are fairly easy for knitters with some lace experience. 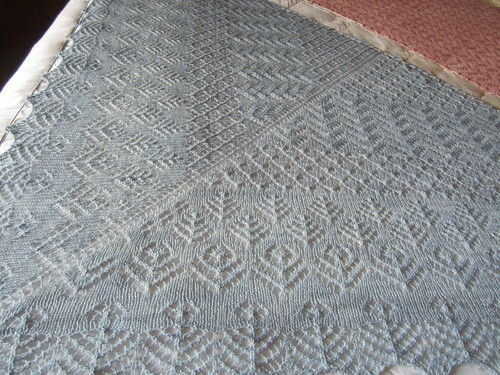 The stitch patterns are varied and none are very hard to execute. 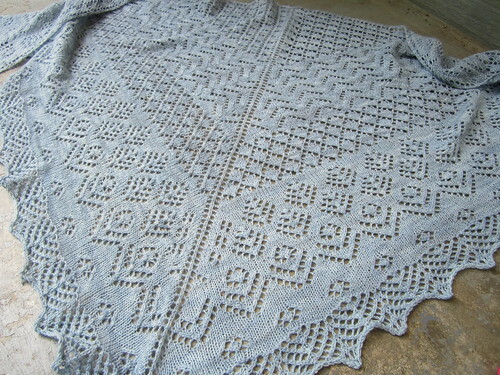 The stole version uses a provisional cast on at the center and is knit to the edges. 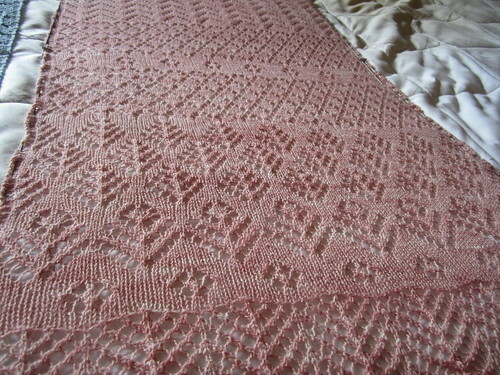 Here’s how they looked fresh off the needles before the wet blocking that I did on them yesterday. Here they are while still on the wires. It was a stretch to pin them both out at the same time. We just barely had enough t-pins. 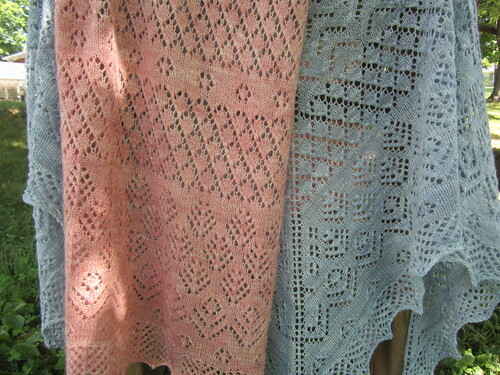 Maybe for my next post I can talk the sister knitters into modeling the sister shawls, LOL! No such luck this morning however. Oh, I have one more bit of knitting to show you. 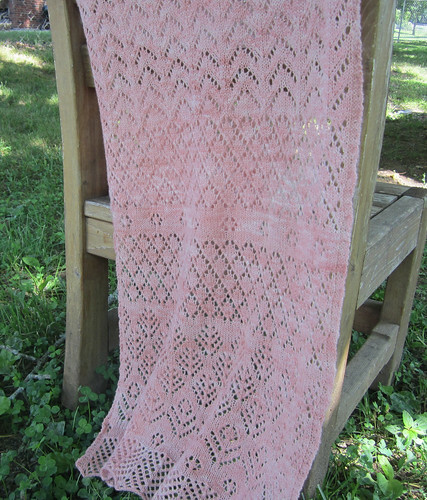 In my last post I told you I was going to start a project that many have requested; a sized up pattern for Sorrel. 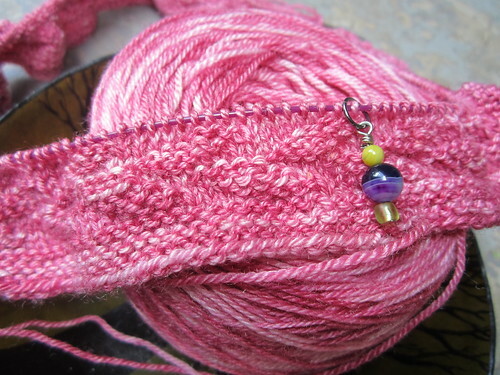 I have crunched the numbers and cast on for one of the sizes which I hope will be my size. I am not very far along yet as you can see and that is mostly lack of energy on my part. You may remember that I told you that we had sickness in the house starting on Memorial Day weekend with my husband and then my oldest son. Well, we all proceeded to get picked off like flies every day or two. It took three weeks to make the full rounds and my youngest son and I were the last two to get it while I was in Indianapolis for Hoosier Hills Fiber Festival last weekend. This thing would hang on with fever, chills, headaches, upper respiratory and a cough for well over a week. We are FINALLY all better. Still working on getting energy back. Anyway we will be leaving on Thursday for Asheville. Maybe we will see some of you there!